High level Delegates from the European Parliament visited MET League of Colleges for a round table meet in association with the Strategic Foresight Group on April 14, 2011. MET invited Mr. Graham Watson, Chairman of the India Committee and World Chairman of Climate Parliament. He is also the former leader of the European Parliament’s Liberal Democrat group, the Alliance of Liberals and Democrats, the third largest group in the European Parliament. He was accompanied with the members of the European Parliament Mr. Charalampos Angourakis, 1st Vice Chair – Greece, Mr. Harlem Desir – France, Mr. Bill Newton Dunn – UK and Ms. Anna Rosbach – Denmark. Mr. Tim Boden, Head of Secretariat and Ms. Emma Mollet, Administrative Assistant from European Secretariat. Ms. Arielle Rouby, Ms. Ursa Pondelek, Mr. Jannes De Jong from Secretariat of the Political Group. Mr. Philipp Oliver Gross, 1st Secretary, Political Affairs and Mrs. Renita Bhaskar, 1st Secretary – Trade & Economic Section from the Delegation of the European Union to India, European Consul General Dr. Leopold-Theodor Heldman - Consul General of Germany, Mumbai were the delegates present at MET. Whereas from India the participants included were Members of Parliament, Legislative Assembly, Heads of Educational Institutions and Selected Entrepreneurs known for Research and Innovation. 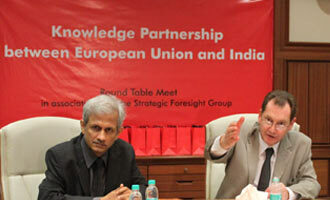 It was a round table discussion to exchange views pertaining to knowledge partnership between Europe and India. MET was pleased to host the interaction in association with Mr. Sundeep Waslekar, President -Strategic Foresight Group and other members from the group, which has a long working relationship with the European Parliament. Their report has been discussed in the Indian Parliament, UK Parliament, United Nations, World Economic Forum and other prestigious forums. Prof. T.R. Doongaji, Dean, Business Excellence, MET Institute of Management & Former Managing Director, Tata Services Ltd.